"First impressions, I'm very impressed. The car is obviously good and it's great to be working with Bruno and back with Rob (Edwards) and Alex again as well. I think it's going to be a fun race. The Indianapolis 500 is just a great race and always different and a very special race to be involved in and even more special to win." "43 laps, I think I'm getting the groove of it now. It was good to be back in the car and be able to practice and do long runs. I think we improved the car a little bit for race set-up. I started out today with a little too much understeer but we made it better and I'm quite happy. I have to thank Derrick Walker for coming in to help and the FAZZT Race Team for their help as well. I think we're going to have a good race car and it's just going to be very difficult to pass especially from where I'm starting. We need to be very patient but that is ok because we have a fast car." And I’m guessing he’d rather not talk about it... As Phillip B Wilson who’s quite the “Stand-up Comedian” has just penned another article for The Star about Indy Racing League Crew Member Carey Hall, who’s been diagnose with Lou Gehrig’s disease; SHEISA! As Carey has courageously decided to continue on his Crewing Duties this Sunday and will be Bruno’s Fueler, after originally being slated to be Jay Howard’s Fuel man on the No. 66 Sarah Fisher racing mount. 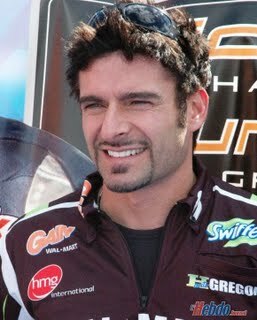 Alex Tagliani:"I'm just very happy again today. The car is good in traffic and I think we have a very competitive car. My goal today was to make sure the car was consistent through the long runs and so far, mission accomplished. We just have 500 miles to go and if we can be there at the end I think we can contend for the win." So Good Luck Alex, Bruno ‘N FAZZT!